Isco reportedly wants to leave Real Madrid. Carlo Ancelotti would consider a sensational return to Chelsea if Jose Mourinho leaves the club – but only if they offered him a permanent contract. Barcelona great Xavi has told Wayne Rooney to play deeper to prolong his Manchester United career. Newcastle target Victor Valdes says he wants to remain in the Premier League when he leaves Manchester United. Swindon are ready to hand their manager’s job to first-team coach Luke Williams. West Brom defender Sebastien Pocognoli is ready to join Championship leaders Brighton on loan. Former Aston Villa boss Paul Lambert believes part of the reason his ex-club may want Frenchman Remi Garde as their new manager is to get the best out of the French players at the West Midlands outfit. Barcelona are ready to double Neymar’s wages to derail Manchester United’s chances of signing the Brazil star. Jamie Vardy will not be allowed to quit Leicester City in the January transfer window unless Real Madrid make an offer too good to refuse. Gus Poyet is set to become the new manager of Greek side AEK. Everton, Swansea and Sunderland all want Bordeaux midfielder Wahbi Khazri. Sunderland boss Sam Allardyce has joined the race for Sion’s Swiss center-half Leo Lacroix. Chelsea and Arsenal are on alert after Lyon defender Samuel Umtiti revealed he dreams of one day playing in the Premier League. Bournemouth boss Eddie Howe believes Jurgen Klopp’s arrival at Liverpool makes it even harder for British bosses to land a top job. 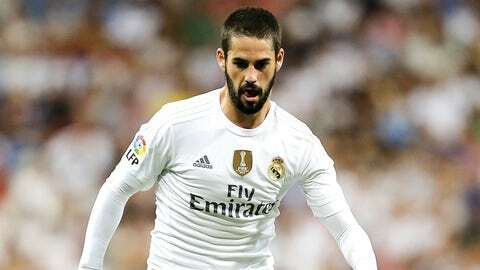 Isco wants to leave Real Madrid with Arsenal, Chelsea and Liverpool set to battle it out for the 23-year-old Spain midfielder. Cristiano Ronaldo is set for a long awaited return to Old Trafford – but only to take part in Wayne Rooney’s testimonial in August next year. Marco Verratti’s agent has told Europe’s elite clubs, including Manchester United, they can sign the Paris Saint-Germain star if they stump up £72million ($110m). Bayern Munich boss Pep Guardiola refused to answer questions on his future with the German champions after further speculation linking him with a move to the Premier League. Former Manchester United youngster Ravel Morrison has been told to forget about leaving Lazio. Christian Benteke is a doubt for Liverpool’s weekend trip to Chelsea after suffering a knee injury. Manchester City striker Sergio Aguero has stepped up his rehabilitation from injury ahead of his comeback next month. Alexandre Pato could sign for West Ham with Corinthians president Roberto de Andrade understood to be looking to offload the 26-year-old forward. Barcelona are planning to give Lionel Messi, 28, a new contract which will see him finish his career at the Nou Camp. French Prime Minister Manuel Valls has said he is willing to offer Barcelona a place in Ligue 1 next season if the Champions League winners are kicked out of La Liga ahead of a potential referendum to decide whether Catalonia remains part of Spain. Nigel Clough could follow in his father Brian’s footsteps by becoming the next Nottingham Forest manager – if Dougie Freedman cannot turn his side’s fortunes around. Tottenham have been criticized by environmentalists for taking an ‘unnecessary’ 20-minute flight to play Bournemouth at the weekend when a coach trip would have taken just over three hours.